Police are on the lookout for the 35-year-old New Jerseyan, who allegedly allowed her small dog to urinate on 14 dresses and 11 pairs on pants at a clothing store. 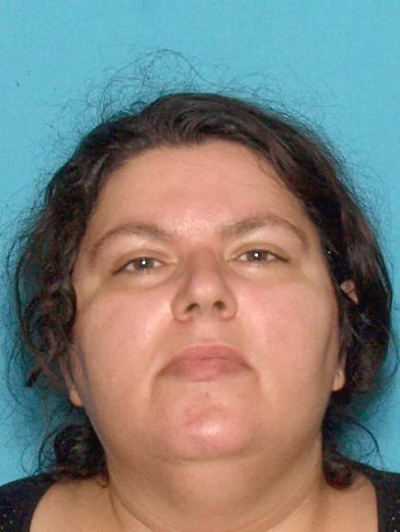 According to investigators, Tumbleson and her pooch yesterday entered a Lane Bryant store in Toms River around 1 PM. The dog, cops report, proceeded to urinate on the garments, causing more than $2000 in damages. After the dog soiled the clothing, store personnel asked Tumbleson to leave the business. But she “became belligerent and refused,” prompting workers to dial 911. As officers arrived at Lane Bryant, Tumbleson sped away in her Chevrolet Malibu, eventually running several red lights while being pursued by police. Due to the wet roadway and a fear that the pursuit could imperil others, cops discontinued the chase of Tumbleson, who is pictured above. In addition to charges stemming from the Lane Bryant incident, Tumbleson will face counts for eluding police and obstruction when she is apprehended. Bail has already been set at $30,000 for the latter charges.